He proposed a thought experiment which I’d like to share. Imagine that you can teleport anything in the world to your lap with a single thought. How often would you walk to the fridge for a drink? This is a valid question, and it is something that we should be asking. I think his question also illustrates something that I’ve been hearing from others. There are people who, at times, are looking for utility while they happen to be in virtual reality. They may want to quickly launch a specific application or to do a quick search. There are also some people who simply don’t want to use a virtual environment as a metaphor for accomplishing their goals. In these cases, engaging the metaphor of a virtual interface is simply a nuisance. Instead of looking ahead, let’s look behind us for a moment. I’m a command-line interface (CLI) kind of guy. With the right incantation of words, I easily perform any everyday task (and far more). Why would I ever want to a graphical user interface when I have something that does the job simply and efficiently? This is an old argument that hasn’t completely been settled. My first answer to Rosc would be that different people require different needs. In the middle of a previous article, The Metaverse and the Virtual Home, I described one way that The Librarian might be embodied. The Librarian is a Siri with a virtual presence, which would act as a launching pad for other destinations. You approach the Librarian and verbally tell it what you want. The matching results would be displayed along the wall. After making your selection, you travel through the doorway and into your selection. What if all I wanted was to quickly launch a hexadecimal calculator to settle an argument of what 9 times F is? Some people want the “virtual worlds” experience. Other people will want to simply hit Control-F on their (virtual) keyboard, type in a keyword and press ENTER. My family? They’d rather avoid the keyboard if they can. As mentioned, I’m a CLI kind of guy. I’m more like Rosc. Out of convention, I’d want to try the full virtual-worlds approach. After a while, the decay of novelty is probably going to set in. I’ll want a less elaborate method to be available, in addition to the full virtual world experience. Part of the value of a virtual space is the atmosphere — the overall feeling or effect of an environment. We want the functions in our virtual space to be consistent with the environment. We want our virtual functions to sell the environment. There is a natural tendency to emulate what we experience in the real-world. What can end up happening is that we can mix the worst aspects of virtual reality with the worst aspects of the real world. Go to the room where The Librarian is located. Approach and face (or gaze at) The Librarian (to inform the Librarian that my voice is directed at them). Tell The Librarian what I am looking for. Move my avatar to explore the search results which are along the wall. Move into a second room where the result will be materialized. Remember Rosc’s question? Why would we want to go all the trouble of engaging a virtual-world search function if we could perform the same function much easier with a conventional GUI? When possible, don’t make the player move inside of a virtual world to engage a function. Instead, make the virtual world bring its functions to the user. Using this idea, how could we rework The Librarian to create less effort by the user? Let’s re-evaluate those steps. 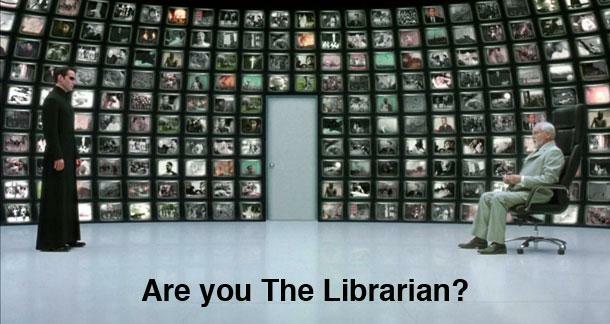 Perhaps you could call for The Librarian and be teleported to the library. That’s one way. How about we let The Librarian do all the work? You call forth The Librarian and let him come to you. No movement by your avatar is necessary. This step helps to direct which vocalization is meant for which recipient. (Even more so in a multiuser environment.) With eye tracking, the effort involved in a gaze is minimal. Without eye tracking, position and facing or a mouse click may be a minimal effort. The ability to direct audio at a single recipient may make this step worth keeping. This step is unavoidable; we have to tell The Librarian what we’re looking for. There are many different ways which search results could be handled which still maintain an in-world theme an atmosphere. Perhaps your current surroundings fade as you are surrounded by a round cylindrical wall of search results. By using non-euclidean geometry, we could have a wall of results that continues endlessly as you turn to the left and the right. As an alternative, perhaps a monolith of results rises up from the floor, and the user is given the ability to move the monolith up and down to explore additional results. This step is unavoidable. We could merge it into the next step (moving through a doorway) by making each search result a doorway. This step may not even be necessary. If a user selects a desired result, why do they have to move into another space to materialize it? Their current room could dissolve and be replaced by the selected destination. For some people, Virtual Reality is the destination. For others, it is the canvas. Keep in mind that at the same time you’ll want to impress first-time users, you’ll want to deliver efficiency to experienced users. Offer ways to minimize effort and minimize time. Keep it tight. Always provide shortcuts for experienced users. Virtual Worlds have to deliver to both audiences at the same time. There was an interesting discussion at Reddit around this time I wrote most of this: Why we should have Superpowers in the Metaverse. Superpowers are certainly one way to tackle problems such as speed and long-distance travel. Is part of the answer to go beyond the real-world human experience?